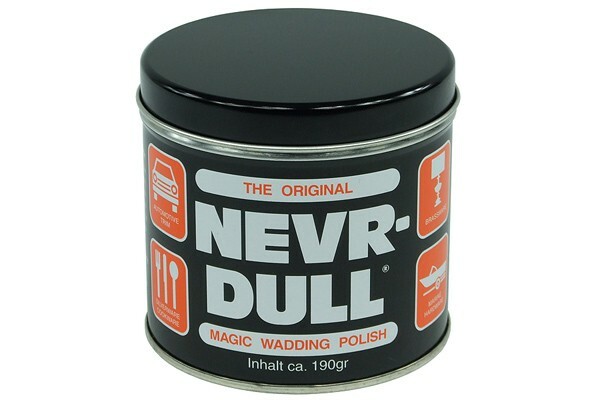 NEVR-DULL is a truly amazing product which will polish and clean any non-coated metal in no time. The container is filled with plenty of a specially treated cotton polishing wad. Simply take a bit from the wadding out of the container and rub with light pressure over the metal surface. NEVR-DULL works works immediately and removes rust, dirt and stains. Let dry for a short while until a light white film has developed. Then simply rub off the film with a soft, clean and dry cloth and the metal shines like new! Tightly seal the container after use to prevent drying out of the wadding to avoid loss of effect.